Collins Booksellers - Barron's SAT 1600 by Linda Carnevale M.A. & Roselyn Teukolsky M.S., 9781438068107. Buy this book online. by Linda Carnevale M.A. & Roselyn Teukolsky M.S. 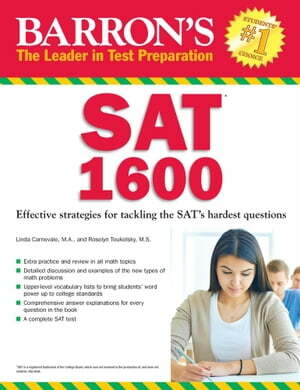 Barron’s SAT 1600 is based on the new Spring 2016 SAT test, and it includes extra practice and review in all math topics, upper-level vocabulary lists, comprehensive answer explanations for every question, a complete SAT test, and more.